Why is the 'straight line' path across continent so curved? This is the result of mapping the straight line path from a point in US to Poland using Distance Measurement Tool. Also, planes from Asia to US would travel almost over North Pole. Why is the path so curved? I agree that this is a flat representation of a sphere, so I do expect some arc, but I don't think earth has this much curvature. The distortion is necessary to explain the curvature of this geodesic on the map but the connection between them is subtle. More can be said that is at once useful, informative, and elegant. See whether you agree. 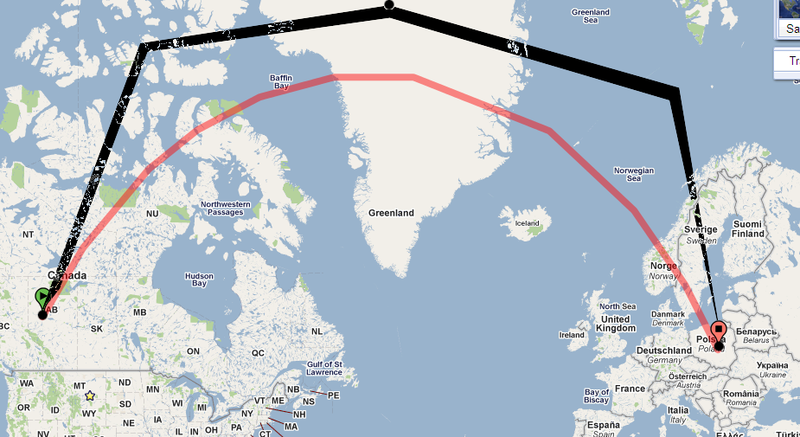 Loxodromic: any route of constant bearing (on the earth) is rendered as a straight line segment on the map. These properties make it easy to read some critical information directly off the map. In this context I am most interested in the angles made by any path with each of the meridians it crosses. (These are the bearings measured from the north.) 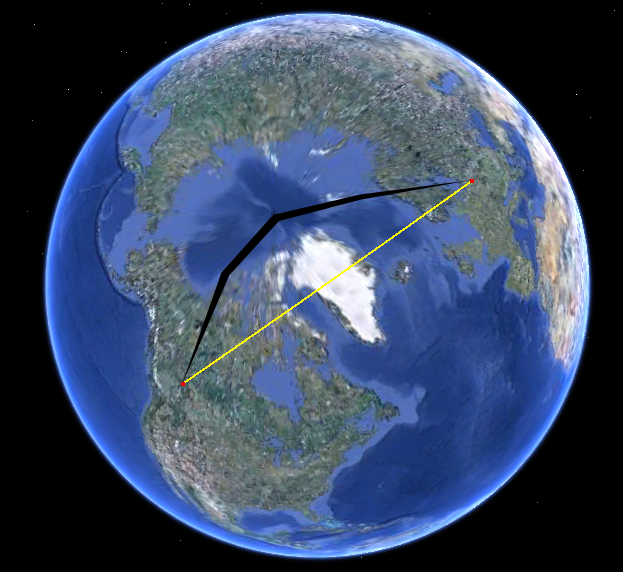 For instance, the path depicted in the question starts in Canada, around 54 degrees latitude, making an angle of about 30 degrees with its meridian. Theorem (1743): On a path in any smooth surface of revolution, the product of the distance to the axis with the sine of the bearing is constant if and only if the path is locally geodesic. Thus, since we are starting off at latitude 54 degrees at an angle of 30 degrees, the product in the theorem equals cos(54) * R * sin(30) = 0.294 * R.
This says that by the time we reach a latitude of 73 degrees, we must be traveling due east! That is, the path, in order to be a geodesic, must curve so strongly that the initial bearing of 30 degrees (east of north) becomes 90 degrees (east of north). After doing a few calculations like this you develop an intuition for what Clairaut's Theorem is saying. A path in a surface of revolution (like the earth) can be geodesic (locally shortest or "straight") only when (a) its bearing becomes more parallel to the meridians at points far from the axis and (b) its bearing gets more perpendicular to the meridians at points closer to the axis. Because there is a limit on how perpendicular one can get--90 degrees is it!--there is a limit to how close to the axis you can get. This constant adjustment of bearing (= angle to the meridian) and latitude (= distance to the axis) causes the apparent curvature of geodesics on most maps, especially on those using cylindrical projections, where the meridians and lines of latitude are rendered as vertical and horizontal lines, respectively. The equator must be a geodesic. No line of latitude, other than the equator (and the poles, if you want to include them), can be a geodesic. Not even a small part of a line of latitude can be geodesic. Loxodromes (aka rhumb lines), which are lines of constant bearing, cannot be geodesics unless they are meridians or the equator. Not even a small part of such a loxodrome can be geodesic. In other words, if you sail or fly in a fixed compass direction, then--with a few obvious exceptions--your path is constantly curving! Point 4 says if you fly from the Canadian Rockies at an initial bearing of 30 degrees east of north, you must appear, relative to north, to be constantly turning (to the right) in order to fly straight; you will never go north of 73 degrees latitude; and if you continue far enough, you will make it to Poland and will be headed roughly 150 degrees east of north when you get there. Of course the details--73 degrees and Poland and 150 degrees--are obtained only from the quantitative statement of Clairaut's Theorem: you can't usually figure out that sort of thing just using your intuitive idea of geodesics. 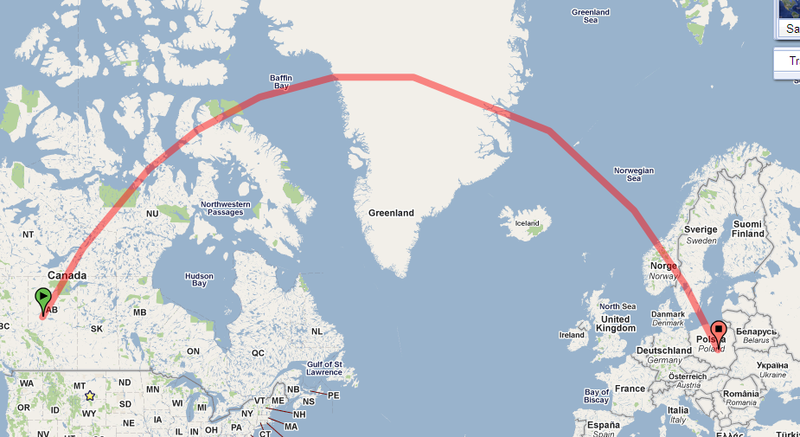 In this projection (Google Mercator), that's what the great circle arc between those two places looks like. In that direction, they will often use the jet stream. In the other direction they will indeed fly over/close to the poles. I saw a very elegant explanation of this phenomenon on Tom MacWright's blog here, with photos of oranges. The explain-it-to-a-5-year-old version: "On a globe, shortest paths are flat, and navigation lines are curvy. Mercator made a map where navigation lines are straight. This made the shortest paths curvy." It is due to the projection of a 2D plane onto a polorised 2 spheres surface, as the line moves past the poles, it becomes distorted as far as observers of the 2D plane are concerned because the straight line to the destination appears to be a curved ark of a Great Circle, which is a term in mathematics that relates to the greatest circle that can be sliced from a sphere, as long as the circle passes through the center of the sphere. I have slightly modifies the Images provided in other answers by scribbling a line across to illustrate (rather poorly I'm afraid, I'm new to GIMP) The so called polar distortion. I think some similar concept Is behind Gravitational forces, but I'm not a physicist so I couldn't say. The closer to the Poles a point gets, the less deformed it appears to be when rendered onto a Flat 2D surface, although it still is by a tiny amount. It also depends on the Projection method used, and there are some that are focused on making the quickest route between two points appear to be flat and then round back on the full spherical view. Not the answer you're looking for? Browse other questions tagged coordinate-system google-maps distance spherical-geometry curvature or ask your own question. What Makes a Map be classed as Badly Designed? Is there a way to draw a straight line on a map which also represents a straight line on the earth surface? How to place markers on the outline of a circle in google maps? What is a delta in lat/lon called? Defining a line from geographic coordinate points. 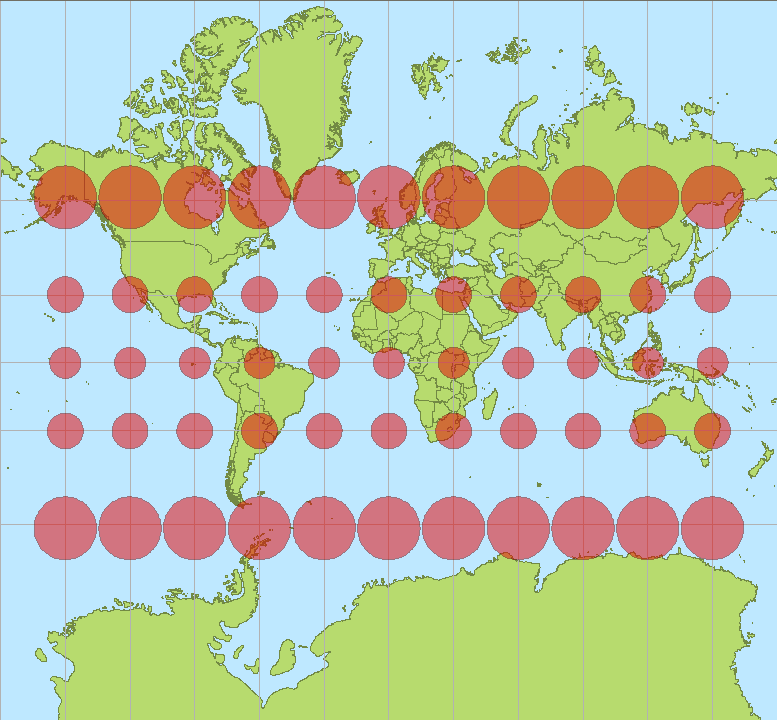 Does the Chamberlin trimetric projection map (some) great circles to straight lines? Given a flight path given in latitudes and longitudes, how do I find another flight path that is parallel to the path given? Why does the earth drop off faster than expected over a geodesic when converting from lat/lon to cartesian coordinates? Is there a coordinate system specifically designed for oblique map viewing?